Who calls you to a place you love. Saint Agapetos lived during the reign of Diocletian (284-305), and came from Cappadocia, the son of Christian parents. When he was young in age, he went to a monastery there, in which there were around a thousand monks, who gathered various virtues, as a bee gathers from various flowers. There he stood as a tried laborer of the commandments of the Lord, and brought to naught his body with fasting and vigil and with the other means of self-control. For a period of eighty years he ate only bark and lupin pods and ashes instead of bread. He also was victorious over sleep, as much as it is possible for someone. He was serviceable and studious in his duties to the brethren of the monastery, and he referred to all the monks as master and lord. Thus he was made worthy to receive from God the grace to do miracles. By his prayers he put a dragon to death, and healed a maiden from the ruin of an illness. Therefore he was loved by all and held in wonder. By this Emperor Licinius (313-324) found out how this Saint was manly in body, so he conscripted him against his will and numbered him in his army. Despite this, the Saint continued his habitual ascetic struggle, and was unfailing in performing his duties as a soldier. Not only did the renowned one heal the untreatable and deadly ills of people, but also that of horses and cattle and every other type of animal, by his presence alone. Because at that time the Saint saw how the victorious Martyrs Victorinus, Dorotheos, Theodoulos and Agrippa were being harshly punished for their faith in Christ, he also wanted to partake in their martyrdom. Wherefore, having been beheaded, they were perfected and received the crown of the contest. Then the blessed Agapetos, being struck with a spear, was kept unharmed for the sake of the salvation of many others. When Licinius departed this life and Constantine the Great received the empire of the Romans, then the following took place. A servant of the emperor who was useful in his services, became possessed by an unclean spirit. He would cry out and call by name Saint Agapetos. Therefore the emperor had him brought to the palace, and as soon as he prayed, the demon departed, and the servant was healed. The Saint asked no favor of the emperor, except that he be set free from his military duty, and go to his beloved quietude. The emperor immediately approved this. When the Saint returned to his quietude, the Bishop of the city of Synaus, which is found in the heart of Phrygia towards Bithynia, forty miles from Nicaea, and honored with an episcopal throne under the Metropolis of Hierapolis, took the Saint, and ordained him a Priest against his will. Having died shortly thereafter, the great one was ordained Bishop of Synaus by the election of God as well as that of the priests and all the people. As soon as he became Hierarch, he performed greater miracles and was made worthy of the prophetic grace. To clearly prove this, we will mention some of his prophecies and miracles that the Saint performed. One woman that had heard of this Saint, and would have loved to receive his blessing, went to him, and when the Saint saw her, he told her everything about herself from her childhood, and having advised and benefited her, he sent her away. 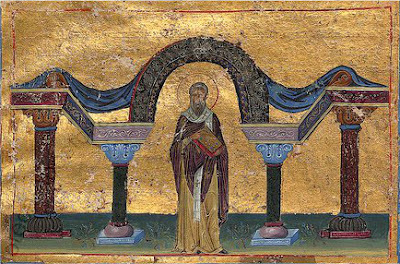 Another time a Deacon from Heraclea in Thrace, when he approached to receive the grace of his blessing, the Saint rebuked him because he had corrupted a virgin. The fields of the highly favored of God Bishop Damianos of Silandos, a city of Lydia, were disappearing due to the flow of the river passing through it in the winter. By his prayers Saint Agapetos turned the direction of the river towards another direction, and so the fields of the Bishop were kept unharmed. And many other miracles did the Saint perform, which is contained in his history, that number over a hundred. Merely by the touch of his hand, or the shadow of his body, and his words, were untreatable diseases healed. Having conducted himself well and in a God-loving manner, and having attained ripe old age, he departed to the Lord.